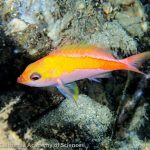 Back in February, I wrote about a beautiful and mysterious Cirrhilabrus that had recently been documented from the Ogasawara Islands of Japan. It created quite a bit of conversation amongst scientists and aquarists alike. Was this a newly discovered species? Was it a hybrid, and, if so, what was the parentage? Now, after four long months, this enigmatic fish has again been found, and this time it has been photographed by its discoverer, Shuichi Kobayashi, in the height of its nuptial coloration. 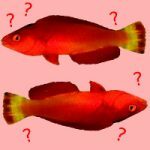 These new photos provide a bit more information to ponder and allow us to refine our theories on this fish’s provenance. Several features of its coloration immediately stand out. 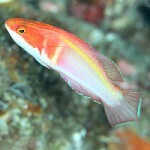 The median fins are a deep, saturated red now, and the yellow dorsal stripe stands out starkly against the pale body. Most noteworthy are the ephemeral white markings which shine during the nuptial display, consisting of a white vertical bar behind the pectoral fin and a suprapectoral blotch that extends into the front portion of the dorsal fin. These white markings might suggest one plausible parent species, the poorly understood C. katherinae. It too has a white vertical bar in roughly the same location as our mystery fish, but in C. katherinae this marking is typically much wider and less distinct. 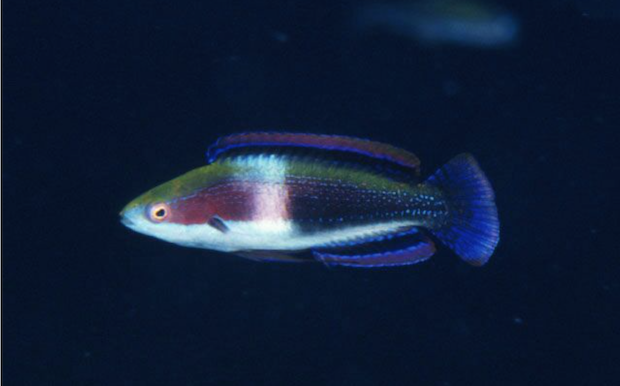 And, adding to the uncertainty, there appear to be separate populations centered on the Ryukyu and Mariana Arcs that differ in their nuptial displays; those that occur in Ogasawara tend to have a rather different patterning which lacks the white bar. It certainly is worth entertaining the notion that our Ogasawaran oddity might be a C. katherinae hybrid, but there are also many morphological traits (pelvic fin shape, caudal fin coloration) that argue strongly against this. 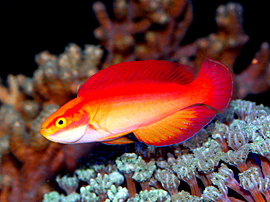 Cirrhilabrus are quite conservative with regards to which species they are willing to mate with, which is why known hybrids tend to be amongst closely related species. 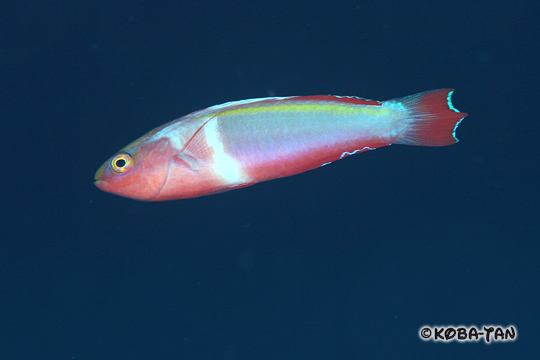 There is little doubt that our fish shares many traits with the C. lanceolatus species group. We see evidence for this in the short pelvic fins, lanceolate caudal fin, the bold dorsal striping, and the large, unpatterned fins. In my previously proposed phylogeny for this genus, the group to which C. katherinae belongs is only a distant relative of the lanceolatus species group, making it unlikely these clades would have been able to intermingle. So if not C. katherinae, then who? 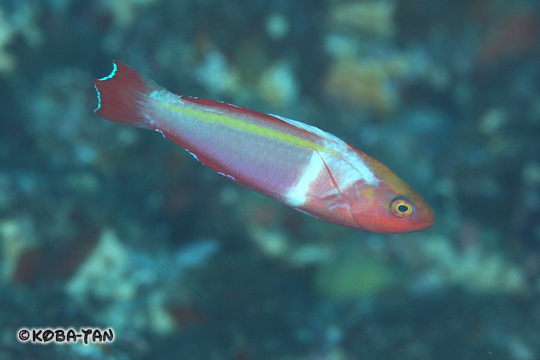 In my original discussion on this fish, I put forth the crazy suggestion that the Hawaiian endemic C. jordani was involved. 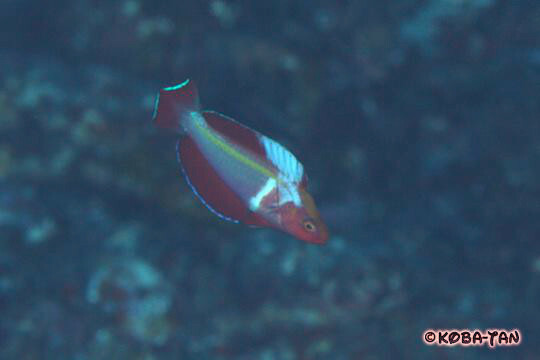 It too belongs to the lanceolatus group, and it shares the brilliant red fins seen in the Ogasawaran specimen. The main sticking point to this theory is that C. jordani has yet to be found anywhere west of Hawaii, but we know that other reef fishes (Yellow Tang, Japanese Angelfish) have made this biogeographical leap, and there are plenty of seamounts which would offer suitable habitat. Our knowledge of the marinelife in this portion of the ocean (particularly from mesophotic depths) is still minimal, so, while far-fetched, this theory warrants some investigation. 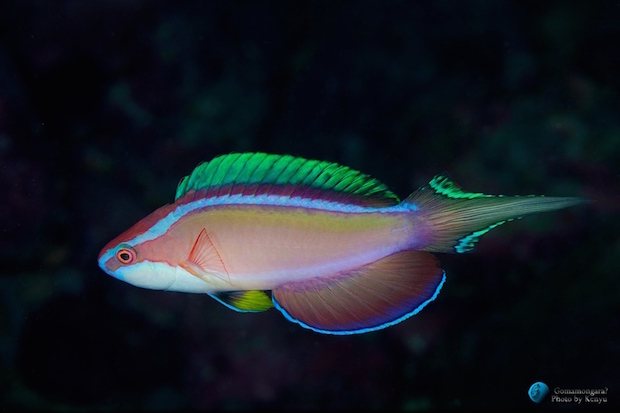 Lastly, there is the exciting possibility that, like the endemic angelfish Genicanthus takeuchii, this fairy wrasse is a previously unrecognized species found only at this isolated island group. Due to the location of these islands at the intersection of the Japanese, Micronesian and Hawaiian ecoregions, there is evidence that speciation is advancing due to hybridization. We see this in the unusual patterning of G. takeuchii, whose markings are most consistent with other known hybrids in that genus, as well as the Yellow-crowned Butterflyfish Chaetodon flavocoronatus, which occurs just to the south at the Mariana Islands and is almost certainly derived from the mixture of Micronesian and Hawaiian parent species. Might the Ogasawara Fairy Wrasse fall into this same category? 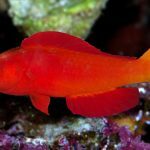 What’s desperately needed are more observations to document whether this fish is just a one-off hybrid or if it might occur in larger groups at greater depths. 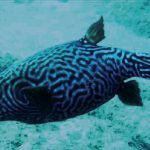 While there may not yet be a consensus on what this strange fish is, I think it can be agreed that this is one of the most spectacular wrasse discoveries in recent memory.